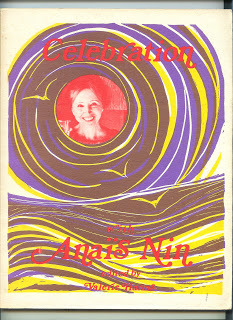 Today is the 40th Anniversary of the Celebration Weekend with Anaïs Nin at Rye New York. Valerie Harms, was the editor of the Celebration Book and graciously allowed our site to make it available on our web site as copies of the original became rarer and rarer to find. To find a print edition of the book, check out ABE.com depending on the condition you can find an original from $8.00 to $55.00. And, finally, words from Anaïs Nin, whose person was the beginning, center, and end-purpose of this book as well as of this Celebration confirming the infinite circular motions of life. The drive with Beatrice Harris to Rye; Beatrice who has such a deft sense of direction even while we talk of subtle subjects. We want to redefine the much distorted use of narcissism and ego. The isolation which strikes the neurotic at the first shock of destructive experience is not narcissism. It is not a willful isolation and has nothing to do with self-love. It is a withdrawal to rescue what is left of a shattered self. In the same way, self-development and a quest for self awareness and identity are not ego trips. We talk about our lives, our friends, but it is always to find the meaning of our lives, our friendships. She has that rare mixture of sensuous presence with intelligence and insight which add luminosity and vibrancy to all she does and says. The house at Rye with its stately beauty reminded me of the house of “The Wanderer,” of Alain Fournier, of times when people had a sense of living space. The garden was peaceful and led down to Long Island Sound. It is a home, I thought, in which we arrive as guests, and Adele and Valerie standing in the entrance hall to receive us, makes it seem like the hospitality of friends. They were offering champagne, and the fairytale clothes of Sas Colby were displayed on mannequins, setting a mood of color and fantasy. We are distributed to our rooms by Mr. Hewitt who acts as if he were personally interested in our comfort. I can see the Sound from my window. I can feel the presence of the trees. Adele Aldridge has placed on my bed a gift of her book illustrating the I Ching. A beautiful book with bold and vivid designs, each one a different mood, emotionally appealing. Her work reminded me of the medieval expression “Illuminated manuscript”, a lost art, but this was an illuminated manuscript, giving the words of the I Ching a face. Eyes of Adele see more than other eyes, she sees dreams as clearly as others see the trees and sound. As I came downstairs I see the faces which will later become the faces of those I was corresponding with, whose inner face I knew, and it was my turn to seek the faces of the letters as others seek the face of the Diaries, to discover the physical presence of my letter writers. Some were friends already: Daisy Aldan with her ever youthful voice and laughter, Evelyn Hinz with her deep dark eyes which convey ad the depth and thoughtfulness of her being, Jeffery Mundy with his airy grace and elusive words, Frances Steloff, with her candid blue eyes and white hair glowing like a pearl. Others whose letters had such vivid accents of distress and solitude: Bebe Herring, tall and beautiful, all eyes too, and Lex Crocker, with his open, warm face and eloquent silences. His letters were moving and deep with feeling. Bebe Herring gave me the Welsh word, furrawn, which means “talk that leads to intimacy.” It had inspired all my lectures this year. Elaine Marks, stood out in my mind as sitting on the front row when Anna Balakian read her essay on my work, nodding her head in approval of Anna’s dazzling study. Trew Bennett, who had written me such spontaneous and confiding letters about her work and her inner journey, now stood before me as beautiful as her letters, whole, with perfect features, so open and tinged with a sadness which never turned to anger or bitterness. The sadness cast her features in a firm, well-balanced beauty. She bears the mark of sorrowing without distortion; it is a mark of courage, of complete sincerity. Her pottery is strong and rich in color. Jeffery delights in juggling words, in mystifying, in eluding finite meaning. He and his brother seem like two aspects of the same being, both handsome, Jeffery more tenuous, more vaporous, James more grounded, more present, not so prone to take flights in space. Nadine is silent, but in her silences, conveys thoughtfulness, inner activity, and one is curious to know her world, but I knew it would take time, and the weekend was so full and rich it did not allow me to stay with any one person long enough. I was making a super-human effort of memory, to fuse the person standing before me with the letters received, to reconstruct the exchange that I want to renew and continue. I do not know why I feel that recognizing others, hearing them, sensing them, is so important to life. Too many of us pass in anonymity, invisible, unheard, and I wanted so much to receive all of them. I feel like a gardener concerned with the thirst of flowers, the leaf in danger of withering, the fruit torn off the tree by the wind. Human beings appear vulnerable, and with great needs. My antennae were spinning furiously to catch all the messages and leave none unheard, but there were so many that I am sure I failed. I read their eyes, I notice when Evelyn sits alone and wonder if she feels isolated, has not found a friend yet. I want to hear every word and receive every message. Our first evening in the library, when I wanted so much to know them, and they talked about the effect of my work, I felt wistful. The role of the writer forces her to speak for others, and I wanted to hear their voices. I had to accept that my diary was theirs, that they found themselves in it, their voice, and that they were speaking through my work, making revelations about themselves. I am moved by the response to my work, the statements made as to its significance at crucial moments of their lives. I wanted them to introduce themselves, and what they told me was of their encounter with my work, and its impact, so I have to speak about their revealing themselves to me through my words, and my being their voice. Happenings begin. The walls are covered with paintings. I notice some large blue sea and sky paintings. I notice masks of iron, abstract and very modern. The face and the cage-like mask interplay, part face, part mask. The sculptor Suzanne Benton is there and later she will talk about the masks while we try them on and see ourselves transformed. The hand printed books are in a glass cabinet, and we will talk about them later. Valerie effaced herself. She was attentive to the flow and continuity, and to the forming of links. She was protective and receptive, asking nothing for herself, running through her slides too quickly for us to seize the intention of her book, a study of the fears which hamper women artists. At times the whole weekend appeared like a ballet. Everyone brought charms, skills, richness, and we moved about discovering each other, we discovered each other’s struggles, evolutions, achievements. We touched, contacted. But I could not select one and go off for a walk, or select two and talk all night; I had a more difficult task which was to respond to all. With all my passion for knowing others, I sought in the few moments given us to perceive a whole life, a whole person. I talked with Trew Bennett, with Lex Crocker, with Bebe, with William Claire, with Georgiana Peacher who is designing and writing a beautiful book, with Helen Bidwell, with Lele Stephens, and others. The next morning (I was the only one whose body refused to stay up all night) I was up early, at six a.m. I saw Trew sitting out by the water’s edge, writing, and I wanted to go out and talk with her, but I had manuscripts to read, Jeffery’s poetry, Bebe Herring’s novel, poems. As I came down the curved stairway Bebe was sitting in a nook, in the sun drenched stairs, with her large questioning eyes. We talked about her novel, her struggle to fuse fiction and non-fiction. She was dressed in a long flower-colored dress, she seemed like part of the garden, a nymph. During the talk in the library on women’s liberation, Beatrice brought her skill at balancing contradictory and extreme generalizations. She restored symmetry and harmony in ideas carelessly incomplete. It was then that Larry Sheehan spoke movingly and humanly. He said that it was concern for his daughter’s future which made him open to the efforts of women to change women’s status. He became aware that his daughter might live in a better world. It was a human and humble and touching concept. Frances Steloff sat gazing at a yellow daisy, her white hair luminous, holding her eyes down, looking into the heart of the flower while telling her story of courage and audacity. William Claire told the story of “Voyages,” that of a man occupied by a full time job, writing poetry on yellow pads during interminable conferences, and persisting in publishing only what he liked. He had the courage to turn down a bad poem by a famous poet, something very few editors are capable of. Color and playfulness were given by Sas Colby. We all tried on her capes, skirts, masks, but when we sat in the garden they came to a life of their own when she put them on, with her pixie face and blond hair, acting out a semidance, skits of her own making, brief airy lines, humorous and in harmony with her clothes. Anna Balakian read a penetrating essay on my work. By way of symbolism and surrealism, she developed the genesis of the work and its ultimate significance. She opened the very heart of the work. Everyone gasped and begged for a copy. I was close to tears at her understanding and evaluation. The evolutions of friendships, of exchanges, of communication through one’s work, were warm and continuous. Everyone was writing; I found manuscripts at my door, poems and letters on my bed. The happenings were necessary to our knowledge of each other’s work, but after that was done, we could have lived together for many weekends and not exhausted all we had to say to each other. Most of them (as I had before the Diarieswere published) had suffered from isolation and loneliness. This was a banquet. I love the French expression “liante”, which means connecting as the branches of the ivy do. In French they say she is “liante” or not “liante”. “Liante”, Lana, a beautiful word. It could have been the keyword of the weekend. An atmosphere was created by Valerie and Adele and Larry, of faith and appreciation and encouragement and response. I felt joyful that my work had made the links, and that I could lie back and enjoy the miracle. They were writing, they were walking together, talking together, they were exchanging books, they were living and I could rest as after giving birth. I was being thanked. But I did not want to rest. I wanted to talk at length with everyone, to read all the writing. I couldn’t. My body could not. At midnight I was asleep. The life current was strong. It belongs to them now. There was in me a wistful relinquishing dictated by the body, but the receptivity never ceases, as if I were responsible for sustaining the life force. I could sleep. I felt I was inside of my Diaries, enclosing new friends, new faces. There was another beautiful young woman who had come to me at Green Bay in tears. Moira Collins. She is here, clear eyed, graceful. I was reminded of my envy of the life of George Sand, when distances by carriage were so great from Paris to country homes that friends visited for long periods. They wrote books, put on plays, worked all day but gathered in the evenings, and I thought how wonderful then to have such long deep days with others when modern life makes our meetings brief and fleeting and travel disperses us. Here we just had time to begin friendships, to give each other courage. They gave me courage. I was moved when Joan Anacreon stood up during one of the dinners and read with great emotion of a poem saying YES YES YES. I may have been the catalyst, but the radiations of the circle extended far, and each circle gained momentum from the contributions of others. Jeffery shed light and charm, Nadine read her music-filled novel, Beatrice clarified tangled thoughts, and left confirmed of her own desire to write. I came away convinced I had found a way to sustain life and creation, and this selection of people proved it; it was filled with talent, skills, beauty. Everything I ever gave was returned to me. We gave birth to each other. we would be most grateful. We didn’t know Mrs. Stuhlmann but forwarded inquiries that came to us from time to time through our mailing address during the early days of the web and we always appreciated her correspondence. 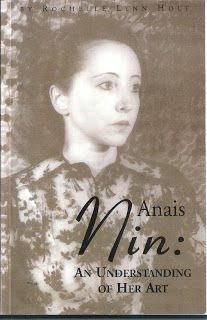 Today, one is able to contact the Anaïs Nin Trust directly although until her death she was the author’s representative. Barbara Stuhlmann 1940 – 2012 Barbara W. Stuhlmann, nee Barbara A Ward, passed away peacefully Friday, Feb. 10, 1012, in her sleep after a long battle with cancer. She was predeceased by her husband, Gunther Stuhlmann of Berlin and Rugen, Germany, who from the age of 16 managed to avoid induction into both the Hitler Youth and German Army. At the war’s end, he emigrated to England and then to the U.S. Barbara was born in Presque Isle, Maine, on May 4, 1940, of Anglo/Irish heritage. During school holidays in the summer she picked potatoes. She later graduated from the University of Maine with a degree in English Literature, and moved to Manhattan in the 1962, where she secured a job with the Times of London. She settled in Greenwich Village and had two novels published which were favorably reviewed in the New York City papers and trade journals. She married Gunther and with him acted as authors agents for clients including Anaïs Nin, Otto Rank, Richard Powers and Thomas M. Coffey among others. 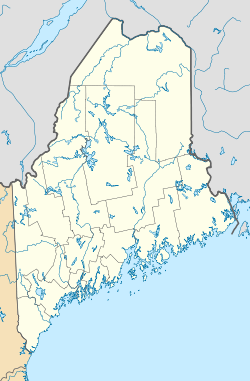 In the early 70’s, the Stuhlmanns moved to the Berkshires and operated the agency from Massachusetts, while they cleared their land and actively participated in the building of their home. Barbara went back to her country roots and was active with flowers and vegetable gardens, bird watching and star gazing. Recently, she had taken an interest as a spectator in Sports Car Club of America motor racing at Lime Rock Park, Conn. There she got to shake hands with Paul Newman, one of the drivers, once a girlhood idol of hers. She will be sorely missed. FUNERAL NOTICE: Services will be scheduled in the Spring at the convenience of Mother Nature. Mary Anne Raphael in an Amazon review of the first edition of Rochelle Lynn Holt’s book: Anaïs Nin : An Understanding of her art. Since this book now sells on Amazon for $121.00 the1997 book was re-published and re-edited in 2010. The updated version was available through http://www.scars.tv but their ordering link for the book does not go directly to the on-line ordering for the book but to Lulu’s marketplace and so we have provided a direct link to ordering the book on Lulu as a courtesy and reprinted the scars.tv info below. Alas, although the initial ISBN number works and links to Amazon, this second edition’s ISBN number does not work. 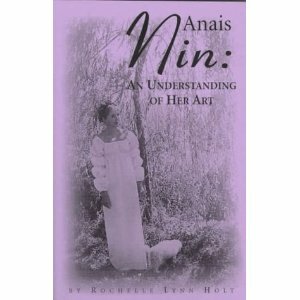 Anaïs Nin: an Understanding of her Art is a book by Rochelle Holt that was originally released in 1997 (which sold out). The book has been further edited by Rochelle Holt, and re-leased from Scars Publications in 2010 (without the index from the original book, but with a new chapter) and is now available for on-line orders. 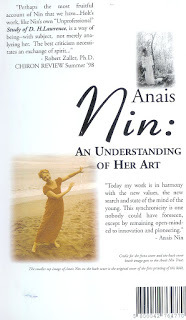 Below on this page is material from the 1997 book release from Rochelle Holt, but you can now order the reprinted version of Anaïs Nin: an Understanding of her Art right now on line directly through the printer. And a thank you to Rochelle for sending on a copy of this updated version.The added chapter, Cafe From Inner Through Outer Space is a very helpful guide to all things Anaïs.